To make the sauce, melt the butter and sauté the shallot and garlic over medium heat (until you can smell it). Add half of the brandy (be careful, brandy may ignite) and simmer. Add the mushrooms and simmer covered for 5 minutes. Remove the cover, add cream, salt and pepper to taste, and reduce until thick. Then add the remaining brandy. In a coffee grinder, grind the wild rice until fine. Pass rice through a strainer to remove large pieces. Place oil in a large sauté pan on high heat. Season the walleye fillets with salt and pepper and dust them in the wild-rice flour. Place each fillet in the pan and then reduce the heat to medium. Sauté until browned (about 3 to 5 minutes per side). 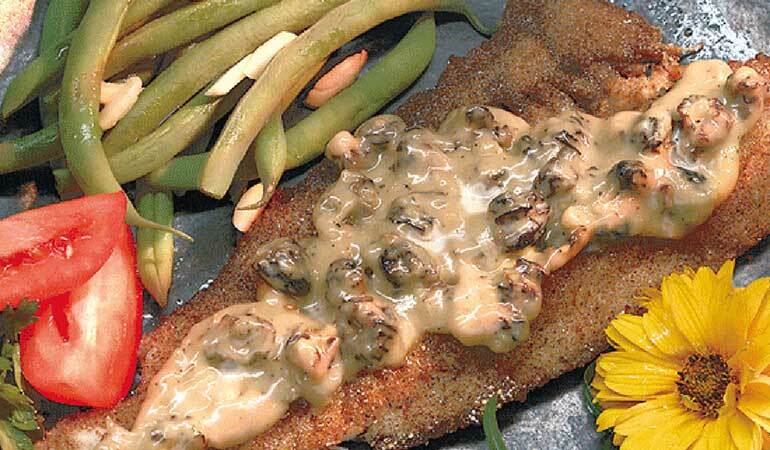 Place each walleye fillet on a large dinner plate and ladle sauce over them. Serve and enjoy.